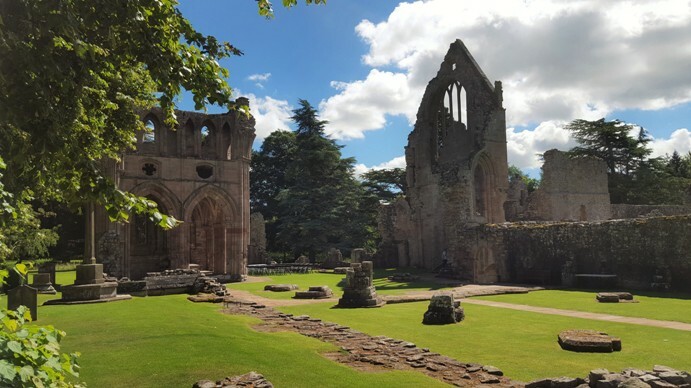 We had a beautiful day down at the stunning Dryburgh Abbey providing music for a lovely humanist wedding ceremony. The celebrant was Fiona Thomas and the weather was fabulous, allowing for an outside ceremony in the grounds of the Abbey. Humanist weddings are very personal and we try to reflect this in the music by working with the bride and groom to choose music that is special to them. As the bride walked down the aisle we accompanied one of the guests singing Real Love by the Beatles . We are occasionally asked to accompany a guest or a singer. For the signing we played Fields of Gold – perfect for such an amazing day, and we got a groove going for the recessional – the Kinks Waterloo Sunset. This was a first for us and we are always happy to learn and arrange new repertoire. Playing outside is always possible if it is warm enough and the abbey provided a lovely backdrop for this humanist ceremony, if a little breezy! We had our roadies with us on this trip and they captured a short video before the ceremony began.